At the core of my concept of Sovereignosis is the Social Mechanic Kernel. There are four independent functions that allow a society to operate, each represented as a fluctuating Venn diagram. 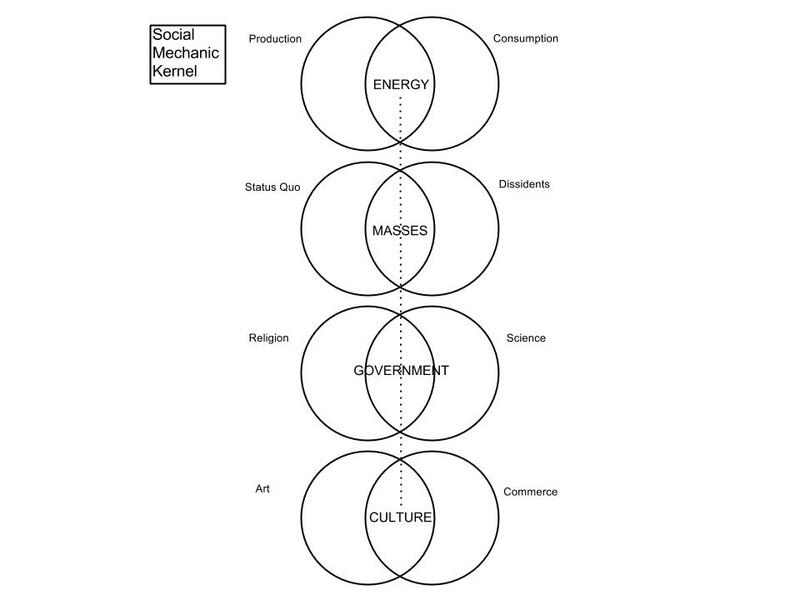 The first Social Function is the Production/Consumption Dynamic and its intersection is Energy. The second is the Status Quo/Dissidents Dynamic and its intersection is the Masses. The third is the Religion/Science Dynamic and its intersection is Government. And the fourth Social Function is the Art/Commerce Dynamic with its intersection being Culture. The Four Social Functions act independently of one another and do not have a direct affect upon each other. They may only affect one another through the interaction of the Four Social Processes (Energy, Masses, Government, and Culture) which are the intersections of each of the Social Functions.